I’ve been looking forward to blogging about this new launch in ages! Yes the excitement rush of waiting has finally arrived readers. 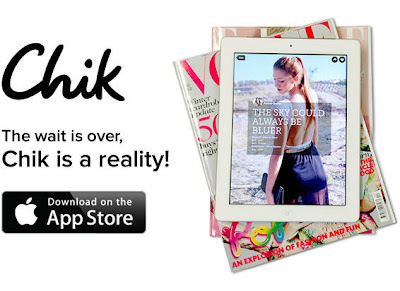 I’m very happy to announce that Chik (Sheek) magazine curated by fashion bloggers and designer’s Ipad app is now available to purchase for free on ITunes. Chik’s website summed up this very well. I could not agree more! Finally the magazine creates the perfect environment for brands to express their interaction with their readers along with, giving them the opportunities to showcase collections, sell products, and even run campaigns. If you are a brand looking for this type of platform please see here for more details. Whilst offering interaction for brands Chik magazine also offers brands to advertise through their magazine however, there is a specific criteria regarding advertising in the magazine. The criteria states that the fashion brand designs or sell Womenswear. See what Chik fashion and content team can offer you today. You’ve read about and now it is the time to download it. You can purchase the app here. It’s a match made in heaven for bloggers and brands! Sign up to their newsletter to get exclusive offers and content.